You guys wanna hear about the story when I nearly died when people I didn’t know were in my garage? One time, I came home from work and it had been a really long day. Like people complaining about bread and whining about how we were out of potato salad kind of day. One lady even told me “shame on you” for not having rolls after being slammed silly ALL DAY and despite the fact that she came in five minutes before close. That kind of day. Little did I know it’d also be the day I could have been murdered. I came home, parked in the driveway and started approaching my house when I heard two male voices. My brother’s car wasn’t around, so I figured it could maybe be the TV or my dad–but who was he talking to if it was? I walked in my empty house, called out to anyone to receive silence as my response… except for the talking. It was coming from down the hall. I took a deep breath as my heart pounded within my chest, threatening to break open my ribcage and come out, cartoon-style. I tiptoed down the hall hearing the male voices grow increasingly louder and louder, now clearly coming from my garage. Who were these men? What did they want? Unfortunately, I was so in the moment I neglected to bring with me a murder weapon. Because if there was going to be a murder showdown I’d at least have a fighting chance. But again, I had a long day of dealing with morons and I wasn’t in the right murdering state of mind so I was woefully weaponless. I took a deep breath, opened the door and screamed from the start “I KNOW YOU’RE IN THERE! SHOW ME YOUR FACES! I’LL STRAIGHT UP MURDER YOU!! I’M CARRYING A VERY LARGE BAZOOKA AND I AM NOT AFRAID TO USE IT! !” I figured since I was weaponless, if I started yelling I had threatening weapons from the start, it’d increase the likelihood that these murderers would want to take my word for it and just bail to avoid getting into a crazed bazooka murder showdown with me. However, these dudes were not letting up. They kept talking about random things and I started looking all over the garage, confused, as to why they were chatting with each other about Led Zeppelin in someone else’s garage who was clearly brandishing a huge weapon. I thought that all until I realized it was our dusty, decrepit radio creaking out their voices in the corner behind the fridge. Someone had left it on… perhaps the true lurking murderers who had used that as a distraction while I searched for them. I never said they were dumb. They were just nonexistent at best. Anyway, after a grueling day of could-have-been-murdered, I decided to focus on my newfound appreciation for life. I realize I do that often, but I love food too much not to use it as a cheap & easy excuse to stuff my face more. 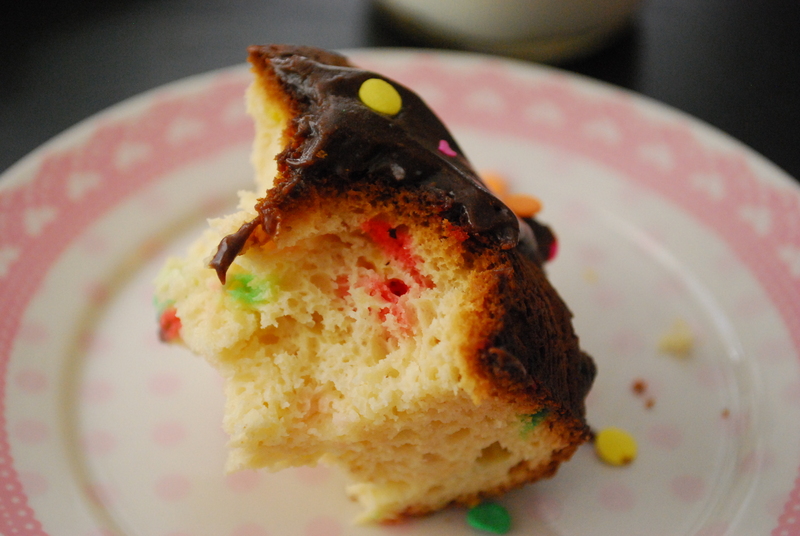 So bring in the Funfetti Donut Cake with Chocolate Glaze. I know I just made a bundt cake recipe this week, but I’m putting this pan to good use FINALLY after having it collect dust in my cupboard. Plus, bundt cakes rule. Sweet, dense, sprinkle-filled and topped with a rich milk chocolate glaze. I dunno about you, but vanilla cakes with chocolate frosting rule my lyyyfffeee. Vanilla frosting is too sweet and chocolate cake is too much. But one with the other? Gimme gimme. 1. Preheat oven to 350 degrees F. Liberally grease a bundt pan with cooking spray. 2. In a large bowl, blend together the cake mix, pudding, vanilla extract, sour cream, oil, applesauce and eggs with a mixer for 5-6 minutes or until creamy and well blended. Batter will be very thick. Stir in about 1/2 cup sprinkles, if desired. Pour the batter evenly into the prepared pan. 3. Bake for approx. 50-55 minutes or until a toothpick inserted near the center comes out clean or with light moist crumbs. Do not overbake! Allow the cake to cool in the pan for 10 minutes before carefully inverting the cake onto a wire rack to cool completely. 4. Remove the foil and microwave half the can of frosting for approx. 30-45 seconds or until slightly melted but not completely runny–watch it closely. 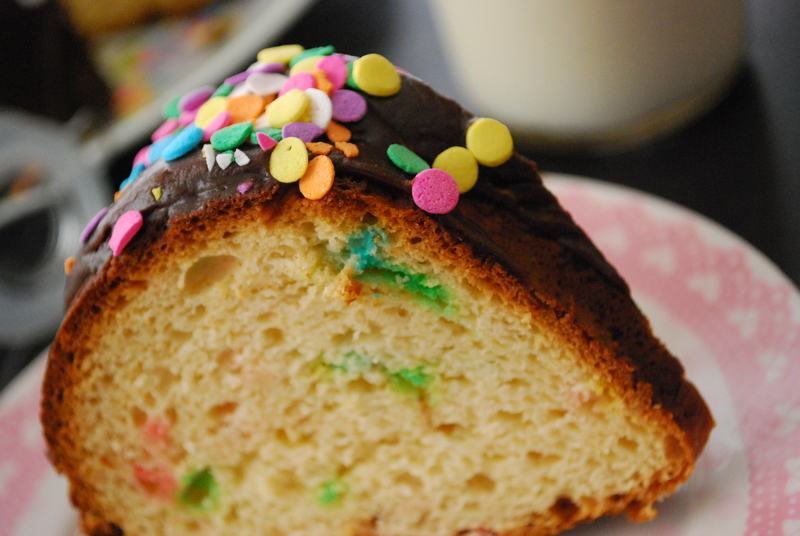 Drizzle the glaze liberally over the cake and sprinkle immediately with the sprinkles or sequins. 5. Serve immediately and store leftovers airtight at room temperature for 1-2 days. Can also be refrigerated if kept airtight. I brought this into my coworkers and they all talked about how awesome I it was. But really, who doesn’t like Funfetti cake? Or chocolate frosting? Or so many sprinkles it could be illegal? All excellent makeups of a truly awesome cake. 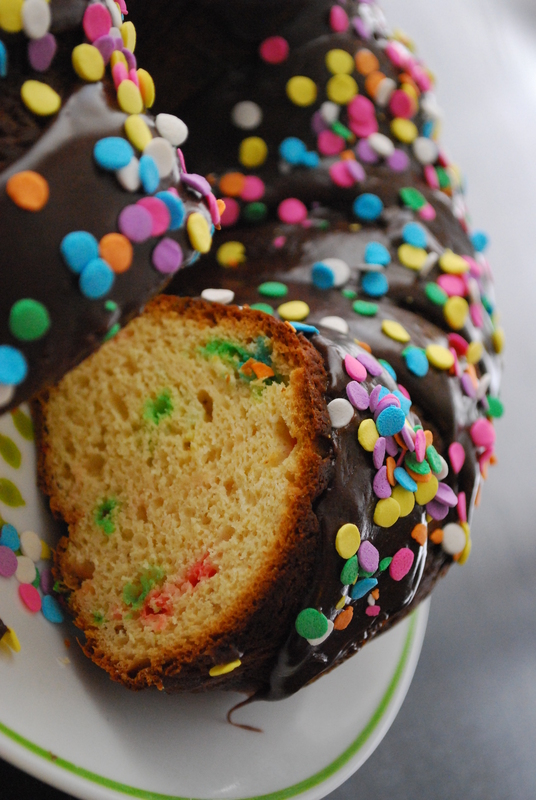 donuts, cake, funfetti, sprinkles…sounds about right! Yummy! love this! Also… Hayley, you MUST remember your murder weapon next time!!! Tsk, tsk. 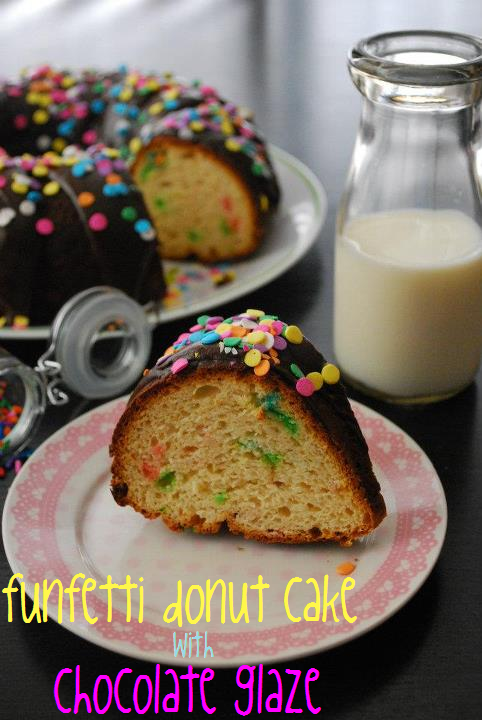 These pictures are awesome and are totally making me crave this sprinkly cake. She’s just so pretty and chocolate covered, and anything covered in chocolate is a winner in my book! I would like to rest your mind at ease about any real or nonexistant murderers you may or may not find in your garage in the future. You are very high on the scale of those “unlikely to be murdered.” I’d be more worried about being held hostage and made to bake for those criminals for the rest of your life. I mean, I’m even considering it…. Keep your eyes peeled, I might be coming for you! funfetti is right! This cake looks like tons of fun! I’m lovin’ all the sprinkles!